Difference between revisions of "Kagura Mutsuki"
Kagura is tall and lean, with purple eyes and spiky black hair. He wears a loose white shirt with black lines accenting the edges. The left side is crossed over the right and secured by three brown belts: two thinner ones at his waist, and one larger one resting over his hips that sports a golden buckle. Draped over his shoulder is a black cape with gold trim and crimson lining, fastened at the neck with a brown belt. He also wears black trousers and brown shoes with steel toecaps. "Don't give up, fight for what you believe in...even if it costs you your life." Kagura Mutsuki (カグラ=ムツキ), commonly known as the Black Knight and Black Gale, is a colonel in the Novus Orbis Librarium. Kagura is the current head of the Mutsuki family, and leader of the Imperial Guards. He led the coup d'etat to remove Izanami from power and seat Homura Amanohokosaka as its new Imperator. Kagura debuted and was made playable in BlazBlue: Chrono Phantasma. Kagura's weapon is an enormous black sword with red grooves along both edges. The handle has a white grip wrapped around it. It lacks a both a tip to the blade and a guard on the hilt, and is shaped like a flat rectangle. A gentleman who likes to flaunt himself and clearly knows that he's at the top, but remains shrewd even while being carefree. Always looking into the future, he knows right from wrong and can cleanly divide good from evil. Kagura can be described to most people as a womanizer and an alcoholic. He often holds wild parties and is sometimes caught hungover from one. Women are his greatest weakness, as he will flirt at the drop of a hat and won't miss a beat even if they retaliate. He sometimes understands when to hold back, but this is not always the case. Underneath this, Kagura is deeply dedicated to Homura, and would go above and beyond for his liege. At times, Kagura affects a serious air, and he has expressed his desire to help regular civilians, not just those close to him. He was close friends with Bang Shishigami in the past, as they were both pupils of Tenjo Amanohokosaka. Kagura's deepest relationship is with Hibiki Kohaku, his loyal secretary and literary foil. The Black Knight is easily among the strongest of the cast. He has fought consistently his whole life and undergone harsh training that has allowed him to best even Azrael's first limiter, a feat that no one else can boast. Kagura's Drive is Black Gale which allows him access to several stances. Kagura primarily fights using Ars Magus. As the head of the Praetorian Guard, his strength is legendary even among the strongest of the NOL's forces. 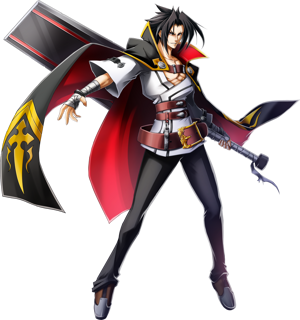 Kagura has a gifted strength and can lift his massive sword with relative ease; he dances around his blade, launching it at his opponents, or uses it to vault over and even as a shield, showing great talent in handling his weapon despite its cumbersome size. His strength has even been compared to Azrael's, although he protests being "lumped in" with the Mad Dog. Despite all his strengths, Kagura still has weaknesses. He can underestimate opponents such as Meifang and be beaten by his chivalrous attitude towards women. The current head of the Duodecim's "Mutsuki Family," as well as the commander of the Imperial Guard and the highest ranking official in the Novus Orbis Librarium. Even while wandering aimlessly, the righteous young man has already raised the flag of rebellion against the NOL, which has deviated from the Imperator's will. The current head of the Duodecim's "Mutsuki Family." He serves the Imperator Homura Amanohokosaka, is the highest ranking officer in the NOL, and oversees the Ikaruga Federation. He disembarks in Kagutsuchi along with the Fourth Thaumaturgist Squadron that he directly commands to complete his mission to subjugate the Grim Reaper. The head of the Mutsuki Family of the Duodecim. He is a commander of the Praetorian Guard, and the highest ranking official in the Intelligence Department. His rank is Colonel. He has no shortcomings in both politics and martial arts – and wields his massive sword with grace, earning him the nicknames, Black Knight Kagura, or Black Gale. If there were two things in the world he could not survive without, it would be alcohol and women. He's a man of gentle manners but is always in some way showing off. And it might seem like he constantly wavers in attitude and opinion, but he never forgets his own sense of justice when it's time to act. The Mutsuki Family has been placed in charge of overseeing the Ikaruga Federation since the war came to an end. But that does not mean he enjoys it. Recently, he has begun to doubt the Imperator's methods of enforcing order upon people, and while being a member of her closest guards, the Praetorian Guards, he secretly plots a coup d'état. To correct the wrongs in the world from the inside of the NOL, he resorts to drastic measures, reaching out to the NOL's sworn enemy, Kokonoe of Sector Seven. Simultaneously the head of the Duodecim’s Mutsuki family, the commander of the Praetorian Guard, and the highest-ranking officer in the NOL. He bears the names “Black Gale” and “Black Knight Kagura”, and his ability in battle is such that he can settle his surroundings with just a glance. The mobile game, Mabinogi Duel, stars Kagura as a playable card. In the BlazBlue 10th Anniversary Character Poll, Kagura placed 24th out of the 84 candidates. He scored one place above Amane Nishiki and one place below Izanami. He had 949 votes. When performing attacks, Kagura will call out the names of various dragons and draconic creatures from folklore and mythology. Kagura's birthday is Half-Collar Day, a day to relax from work. This is likely a reference to Kagura's laid-back demeanour concerning his work. He shares his birthday with Avenge. In Library Mode, Kagura is mistakenly called the highest ranking official in the Intelligence Department rather than NOL as a whole. Kagura is the second unlockable character in the series, being unlocked once the main story of Chrono Phantasma has been beaten. 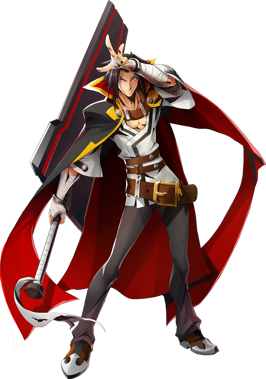 He is also the first unlockable character who can be played before they are unlocked, being used to fight Ragna the Bloodedge at one point the story. Both Kagura and Litchi Faye-Ling share a fondness for alcohol. Kagura is one of the few characters who recognizes that they are fighting themselves if in a mirror-match. If Hibiki Kohaku is fighting Kagura, his move Piercing Feather will throw paperwork instead of knives. This is only a cosmetic difference, and the move deals the same damage regardless.